Here is the homily I preached at St Mike's this Pentecost Sunday about the Sacrament of Confirmation. 23 Jesus answered him, “If a man loves me, he will keep my word, and my Father will love him, and we will come to him and make our home with him. 24 He who does not love me does not keep my words; and the word which you hear is not mine but the Father’s who sent me. 25 “These things I have spoken to you, while I am still with you. 26 But the Counselor, the Holy Spirit, whom the Father will send in my name, he will teach you all things, and bring to your remembrance all that I have said to you. 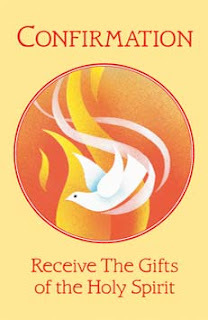 Today we are celebrating the great feast of the Holy Spirit, Pentecost, and Archbishop Lori has asked all priests and deacons to dedicate our homily to the Sacrament of Confirmation. I figure the best way to do this is by starting from the basic question: How does one becomes a Christian? If you ask a protestant brother or sister this question most likely they will answer that one has to accept the “Lord Jesus Christ as their Lord and Savior” and “allow Jesus into their heart” before they can call themselves Christian. For us Catholics, there is a bit more to becoming a Christian than just a declaration of our faith. After all it was the Lord who said “Many will say "Lord, Lord" (Matthew 7) but I will not recognize them”. For us becoming a Christian depends not on something we might say in the spur of the moment. For us becoming a Christians is a lifelong process. This becoming is connected to the decisions we make throughout our life; how much have we chosen to love, our family, our friends, our enemies, those how we do not know, those who have become invisible to society. This love determines if we are truly a disciple of Jesus or just pretending we are, after all, Jesus also said that His disciples would be known by their love (John 14). If you think about it loving all the people I just mentioned all of the time is quite a daunting task! Some might say impossible. We would need some type of supernatural love to accomplish this. A love which can only come from God. We call this love Grace, and it is a free gift from God to help us become true disciples of Jesus. We can receive Grace in many ways, however, divine grace, grace that has the power to transform us and take us closer to the idea of a true Christian, the idea every one of us should strive too, is given by God through the 7 the sacraments. Now this is important: I’m not saying the ONLY way to becoming a true Christian is through the sacraments of the Church but that the sacraments are the ONE and EASIEST way Jesus, thru the ministry of his Church, reaches out to those willing to accept this free gift of Grace. Now of the 7 sacraments there are 3 which are specifically oriented to initiate us on the path to become a true follower of Jesus: Baptism, Holy Communion and Confirmation. Each one of these relates us in a particular way to each of the Persons of the Blessed Trinity which is the source of all graces. Baptism joins us into the family of God the Father; from that moment on we can be called children of God. In Holy Communion we have a deep encounter with the Glorified Resurrected Christ, and by eating His Body and Blood, we enter into the intimidate life the Son and the Father share. In confirmation we receive the power of God’s Holy Spirit to help us meet the demands of becoming a full members of Jesus mystical body. Another way of looking at the relationship between these three sacraments is like this: In baptism God’s Grace is implanted into our hearts; in Holy Communion this grace is reinforced, reenergized by the Body and Blood of the Lord, like water makes a seedling grow stronger; in confirmation this grace blooms into the fruits of the spirit. In this moment, the Grace we have received from and since the day of our baptism is transformed into wisdom, understanding, wonder and awe of the sacred (what it’s called Fear of the Lord) , counsel, knowledge, fortitude, and reverence, which are the Gifts of the Holy Spirit. However, even when we are given these gifts it is up to us to make good use of them for the good of the Gospel. As members of the family of God, he expects us to make good use of the grace we receive through the sacraments to further the advance the Kingdom of God. Sadly, many people see Confirmation as a rite of passage a “graduation” from yeas of attending CCD. In fact it is sad to say that the last time we see a lot of the young adults in our parish is the day of their confirmation; the fact is Confirmation should be the beginning of what is supposed to be a lifelong journey, aided by God’s grace, towards becoming a true disciple of the Lord, a true Christian. How one does becomes a Christian my brothers and sister? By loving, not in a human way, but in a supernatural way, through the power of God’s grace, which we freely receive, in the sacraments of His Church.